9:20 - Journalist Jacob Hamburger explains why the new French left has old French left problems. 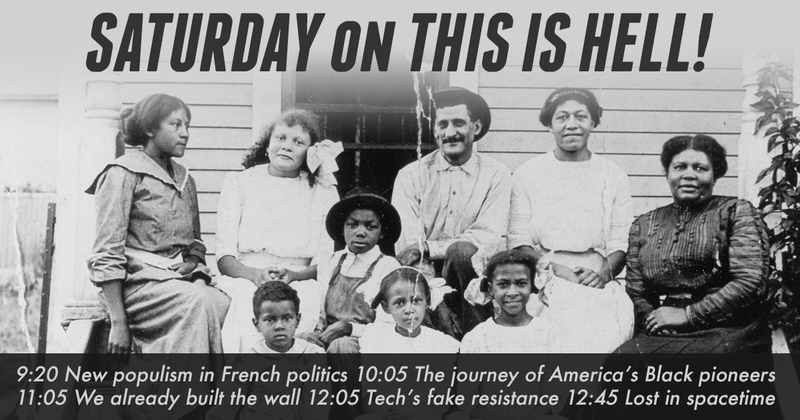 10:05 - Historian Anna-Lisa Cox traces the westward journey of America's Black pioneers. Anna-Lisa is author of The Bone and Sinew of the Land: America's Forgotten Black Pioneers and the Struggle for Equality from PublicAffairs. 11:05 - Journalist Eileen Truax explores the new battlegrounds in America's border wars. Eileen is author of We Built the Wall: How the US Keeps Out Asylum Seekers from Mexico, Central America and Beyond from Verso. 12:05 - Journalist Yasha Levine looks behind the false front of Silicon Valley's corporate resistance. Yasha wrote the article All EFF’d Up: Silicon Valley’s astroturf privacy shakedown for The Baffler. 12:45 - In a Moment of Truth, Jeff Dorchen gets all tangled up in space and time.